This article was originally published in Social Times. Pinterest was one of the most heavily trafficked social media networks of 2011, which was surprising to many because its rise to success was a quiet one. Pinterest is a form of social bookmarking where users pin different images and YouTube videos from across the web to boards they’ve created based on a subject area of their liking. 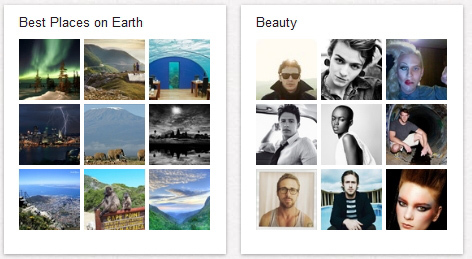 For instance, you can create a board entitled Best Places on Earth and then pin images of island getaways, beautiful landscapes or whatever images you think fit this board best. Your boards are displayed on your profile for your network to see, like or repin to their own boards if they so choose. You’re able to follow other users and/or their individual boards of content they’ve assembled. Pinterest allows users to sign up through their Twitter or Facebook, which makes it easy to connect with your friends already on the network. 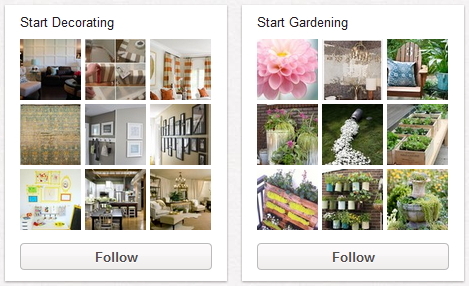 Pinterest is all about discovering images that you wish to share with others in a visually pleasing format. With this in mind, brands should look to create image assets for Pinterest that provide insightful, original or branded imagery and information. After you develop these images, share them on your website and on other social networks to encourage their sharing on Pinterest. The best part of this process is that these images can be pulled from other advertising or used for your other promotional efforts. 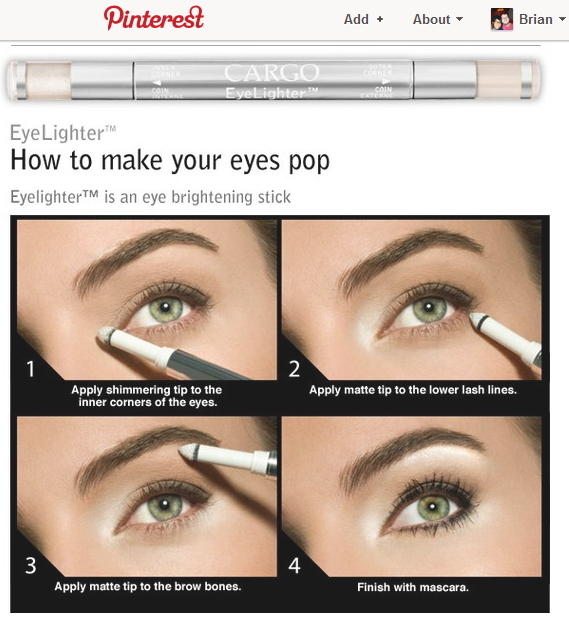 For example, Cargo created this image of their EyeLighter product that give users quick and easy tips on how to make their eyes pop. This is exactly the kind of image assets users love to share on Pinterest because it’s visually appealing and gives insightful information at a glance. Brands should take note and continue to create content of this nature in the future. At this point in the game, users can join Pinterest by invite-only. Once added to the network, you can create your account by syncing with your Twitter or Facebook. The same goes for when you’re inviting users to Pinterest, except you can invite them initially via email. Since there aren’t yet brand specific profiles, you’ll have to invite your brand to the network via email. The Facebook integration at this time is only for personal profiles, not pages. Therefore, choose the email associated with your brand’s Twitter account to set up your profile. Once you’re on Pinterest, it’s time to either keep the profile photo that’s been pulled from your Twitter account or upload a new one. I recommend uploading a new profile photo because this is a different social network with its own unique purposes. To do so, hover over your account name at the top right hand corner and click on settings from the drop down menu. From here you can also alter the name and email associated with account, add a location and website and then add a brief description of your brand. Here you can also choose to link your Twitter to your account publicly. For example, Whole Foods has set up an account and have been actively engaging their community with visually appealing content. 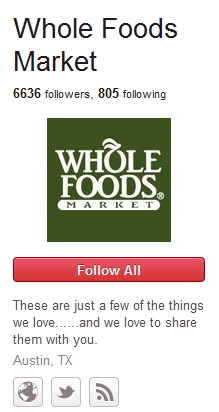 This is good example of how you can brand your profile appropriately to appeal to your audience. There are a few goodies that Pinterest offers brands to add to their websites as a means of connecting their web visitors to their audience on the network. • The Follow Button can be added to your website or blog to allow your web visitors to quickly and easy follow your profile on the network. By giving users the option to follow your brand on Pinterest, you’ll be giving them the ability to look through the images and YouTube videos you’ve shared previously, in the hopes that they’ll share them with their networks again, and you’ll be able to share images and YouTube videos with them in the future since they are now your follower. • The Pin It Button allows your web visitors to pin the content from your website directly to their boards on Pinterest. This plugin should be added to similar places where you would add a Like or Tweet button. By adding this button, you’re making your web content extremely easy to share on the platform. Pinterest’s etiquette states that users, this includes brands, should shun away from using the network as purely promotional. Sharing images & videos from other industry related user’s boards will help keep your profile community based and not just a promotion center for your assets and products. Repin & like other content that suits your community, which will help strengthen your reach in the long term. HGTV’s profile does just this on their Start Gardening board where they share content from both their website and other blogs with valuable content about gardening. This helps them strengthen their relationships with other people of interest in their industry specific community on Pinterest. The main focus of Pinterest is obviously sharing noteworthy photos, but YouTube videos can also be pinned as well (my guess is other types of content will be able to pinned in the future too). Another means of drawing attention to your content is by adding annotations to your videos, basically a call-to-action for your audience to pin videos they find appealing. Similar to creating and sharing images that would be ideal for sharing on Pinterest, add annotations to videos that are short, visually appealing and provide true value to your community like a how to video for baking apple pie or to how to apply the right amount of eye makeup. These annotations should tell them the visitor to “pin this video to Pinterest” or provide a link to your Pinterest profile. The annotation serves as another reminder to users to engage with you in another way in a different community. Since the network is still relatively new, be sure to drive traffic from your existing communities on Twitter, Facebook, Google+ or wherever your audience is actively discussing your brand. Post links to your Pinterest profile, letting your communities know you’re on this network and looking for them to join in and begin pinning your content. How are you using images & videos on Pinterest to promote your brand?